← THESE “FLIP FLOPS” HAVE NOTHING TO DO WITH FOOTWEAR! Great Tribute Article by Allen Dronsfield!! 2018 FSA Masters. 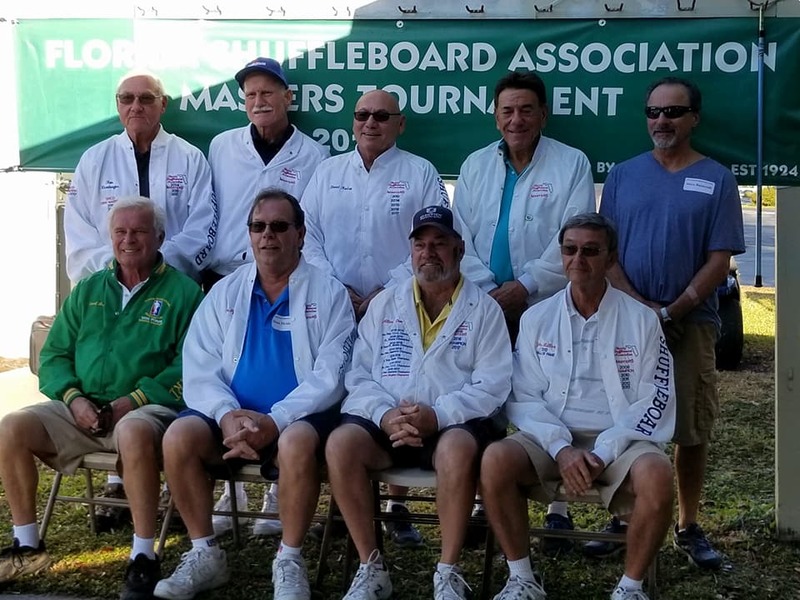 Allen Dronsfield Speaks: The 2018 shuffleboard season has come to a grand climax with Hawthorne hosting the 2018 FSA Masters. What a great job Bob Robinson, Bill Jones Jr. did, putting together a great committee and work force. The hospitality was never ending from the time we all got there to it’s closure. The opening ceremonies got the ball rolling as both ladies and men posed for pictures and received our complimentary cooler bags from Doris Hanke. The helpers pushed carts all day long for three of the four days with fresh cold bottles of water. The pushers did a remarkable job as well; they followed Glenn’s directions to a tee by having the pushers on the yellow side of the court making the first call. Remarkable was that I heard very little complaining about any mishaps such as moving discs prematurely. The Hawthorne staff also swept and re-beaded the courts during lunch each day so as to have fresh beaded courts for the afternoon match’s. Discs were also waxed after each match and ready to go. Pauline and the lunch staff did a great job offering a little change each day with soups, chilli, hot dogs, hamburgers, and sandwiches to chose from, not to mention a variety of desserts. A special hats off to Bonnie Goetzinger and her yummy sloppy joes. Pauline and her staff also did a wonderful job with the banquet buffet. Meatloaf that I heard no complaints about, taters, corn, salad, and a yummy cherry cheese cake to polish it off. I personally can’t think of anything they missed. We arrived each morning to fresh coffee, donuts and cups of fresh fruit, a specially treat. Both of our alternate players were hands on and ready to go if called upon. Steve Raimondi got his chance as Earl was unable to return on the final day due to medical reasons. Steve did him justice by taking 2 out of 3 games while playing his opponent. Not bad for coming in cold and into the heat of battle. Steve and Joyce Smith did a great job keeping score and doing things all along to help out. As usual Glenn Monroe did a masterful job of directing the event, keeping everyone updated on rules and regulations, also keeping an evil eye on those of us that clear a bit to hard. NO WARNINGS WERE MADE.. LOL..
From a personal point of view, I thought this particular masters was very light or loose in nature as far as the tension which can develop during the event. Sure; everyone wanted to win and actually we all did, being the top 16 players eligible to play. From the ladies side Pam Nurnberger set the pace and took an early lead and never gave it up by winning 18 out of the potential 21 wins. From the men’s side it was never really decided until the second game on the final match between Jim Miller and myself Allen Dronsfield. Like last years masters Jim and I ended up on a distinctive colored court. To start with the beads were sticking to the disc due to cooler temperatures. Black prevailed for Jim and I had at least one thought going in that yes I wanted all three but with a two game advantage going into the final match I only needed one to secure the back to back master’s victory. Well I got my turn on black and though I had trouble closing in the end I wasn’t going to be denied the one win I needed. Jim won the lag and chose to go back to black. However it started warming up and the beads quit sticking to the discs and Jim and I had a very casual and enjoyable game and I’ll be darn if I didn’t get him playing on yellow. I realize the results have been posted but here they come again. 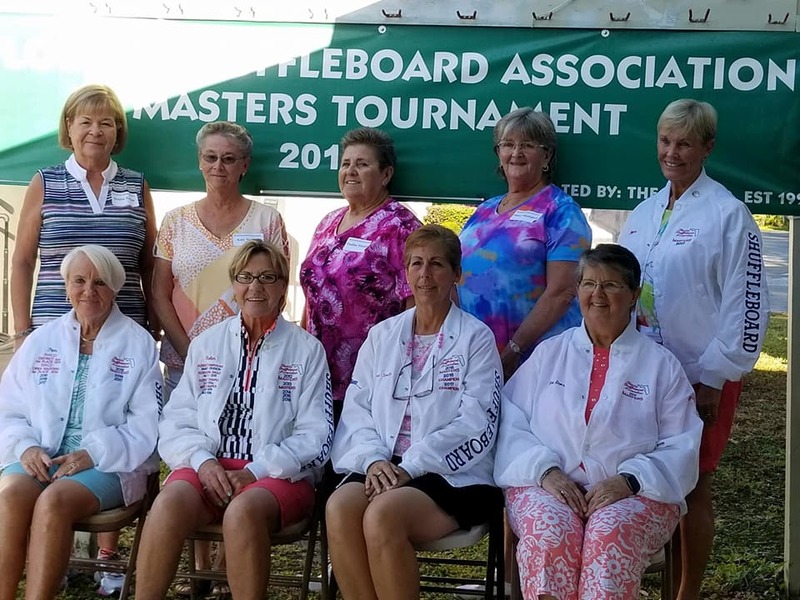 The 2018 Ladies Master’s – The ladies had 4 first time players receiving 4 new white Master’s jacket’s. 3rd. Debbie Norton – A 1st. timer and Debbie did a great job as she was quite nervous going in, it didn’t show however. 4th. Pauline Murphy – A 1st. timer and as a 1st. year pro. 5th. Helen Biaggi – A seasoned veteran with many visits to the Master’s to her credit. 5th. Pauline Murphy – A 1st. timer and as a 1st. year pro. 7th. Alice Enos – I believe this is Alice’s 2nd. trip to the Master’s. 8th. Nancy Mykejord – A first timer also and another husband and wife representatives in the same Master’s. The alternate was Joyce Smith in the 9th spot and 2nd. trip to the Master’s. 1st. Allen Dronsfield also the 2017 Master’s winner making it a back to back victory. Winning with 16 and 5 The only men’s player from the Northern District. 2nd. Earl Ball with 11/2 wins as Steve Raimondi came in from the bull pen in great relief making it 13 wins for Earl, sorry Earl I don’t know the exact number, maybe 18 or so consecutive trips to the Master’s. 3rd. Jim Miller – Many trips to the master’s and the winner of the 2008 Master’s. 4th. Mike Seyfer – This was Mike’s 3rd. trip to the Master’s. 5th. Ron Nurnberger – Ron has many trips to the Master’s and Ron is the excited husband of the ladies champion Pam Nurnberger. 6th. Dean Myklejord – This is Dean’s 2nd. 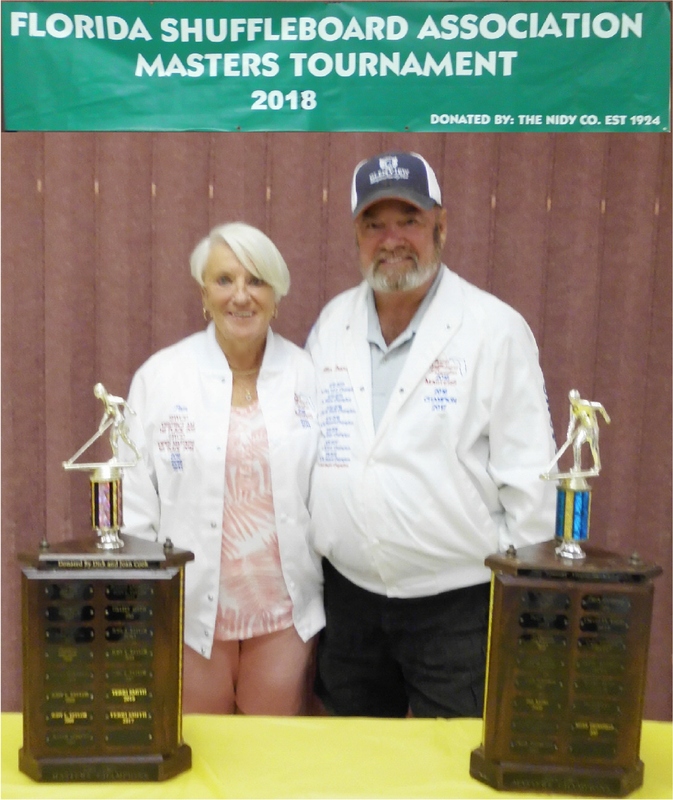 trip to the Master’s and he is the excited husband of the ladies player Nancy Mykleford. 7th. Ken Offenther – A returning player of many appearances to the Master’s and still looking for that first one. The alternate was Steve Raimondi and relief pitcher for Eall Ball – Steve’s first trip to the Master’s. I am sure I have forgotten a lot of data but I hope you get the idea as others I hope will chime in on this great event. I hope everyone will have a peaceful and a restful summer, as it won’t belong before we start all over again in October. Reported from the Northern District by Allen Dronsfield. 1 Response to Great Tribute Article by Allen Dronsfield!! 2018 FSA Masters. Great report Al. Congratulations again.